Many different pubs and bars offer food to go with your beer or cocktail, such as burgers, chicken wings, fries, onion rings and nachos. Often, these foods have too much salt or are deep-fried, which makes them high in calories. 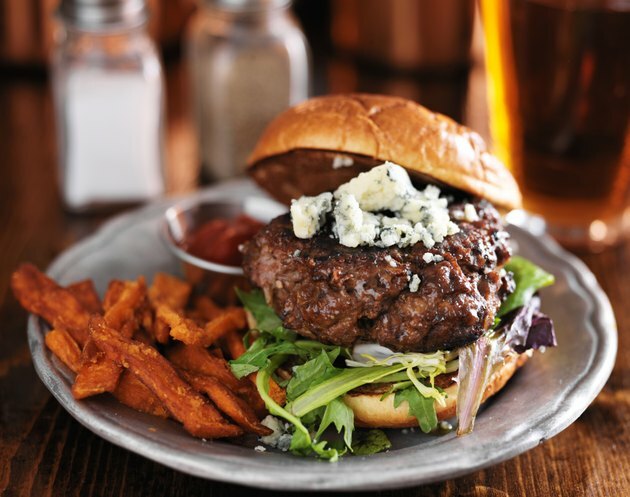 You can find burgers at many different pubs, available in standard types like hamburger, cheeseburger and bacon cheeseburger, as well as many different regional and local specialties. A typical quarter-pound hamburger on a bun has over 450 calories, while a quarter-pound bacon cheeseburger with all of the fixings has around 700 calories, according to the food and diet site Fat Secret. Chicken wings, which are often deep-fried and covered with some type of sauce, typically have about 60 to 100 calories per wing, depending on the variety. According to Buffalo Wild Wings, a standard serving is four boneless wings, which has 288 calories. The standard serving for bone-in wings is also four, at about 384 calories per serving. Many foods that you order do not just come with an entree, but a side dish as well. According to the Fat Secret site, a serving of 10 medium-sized onion rings that has been battered and deep-fried has 197 calories. Ten french fries have about 97 calories, with ketchup adding 15 calories per tablespoon. Jalapeno poppers have about 350 calories per serving, and mozzarella sticks have about 100 calories per stick. An order of nachos supreme, with beef, beans, cheese, sour cream and onions, has 517 calories per order, according to Fat Secret. If you order nachos with just plain cheese, that will be about 350 calories, according to Fat Secret.